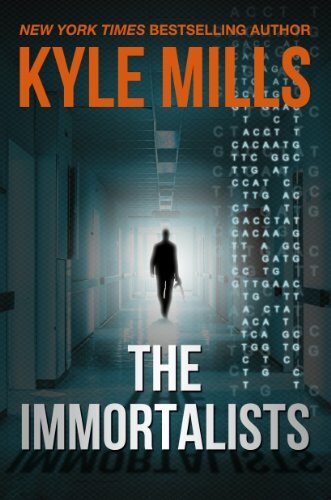 The latest offering by mystery writer Kyle Mills, The Immortalists, is an exceptional thriller with an intriguing philosophical underpinning: the quest for immortality and the social, political, economic and ethical questions such a possibility would inevitably open. Unlike some thrillers with premises that are either too fanciful or involve high international political issues of great moment, The Immortalists is more rooted in the actual everyday dreams and realities of life. The leading characters are not heroes. They do not seek adventure; it happens to them, and they respond heroically. Mr. Mills treats the possibility of immortality as real and imminent through modern genetics and chemistry. Competition for such a far reaching elixir of youth and the desire for exclusivity would, if within reach, be intense. That competition is the driving force behind the story. The fear of death and the concurrent longing for eternal life has been with us since we first became aware that our time on earth had an exit point. Most of the world’s religions promise eternal life as reward for faithfulness. On a more temporal note, the Spanish conquistador Ponce De Leon was led to “discover” Florida because he’d heard that there might exist a Fountain of Youth there. In our own day, those who can afford it elect to have their remains cryogenically frozen against some future time when life and health can be restored to them. All of these have in common the ultimate fear that exists in most of us: that we will someday no longer matter, that we will become extinct. The story of The Immortalists involves the efforts by brilliant but hot-headed chemist Richard Dramen to discover a cure for the childhood genetic disorder progeria that attacks children by aging them physically until they die in their early teens from old age related illnesses. He is motivated by the sad fact that his daughter Susie is a victim of the disease. Of course, funding for such research is always problematic because so few children actually contract the disorder—an estimated one in eight million live births—that pharmaceutical companies see no profit in exploring it. Dramen must sell the cure as a possible antidote for the aging process among the general public if he has any hope of supporting his work. He is not alone. Progeria aside, others have preceded him and more are working concurrently on age reversal itself. Some stand to make huge profits from it such as the multinational corporation PharmaTan. Early on, we are convinced that PharmaTan is a front for an international criminal organization for which industrial espionage, kidnapping, and murder are legitimate means to an end. He is made a fugitive with a price on his head, hunted by everyone with an interest in the research, fellow scientists, colleagues, even people he casually meets end up dead. PharmaTan and those they represent will brook no opposition and want that research. An attempt to kidnap his daughter, and thus control him, leads him to place her with an old friend, a military man, for safety. The need to protect her and establish no “paper trail” that might lead interested parties to find her even through the filling of her much needed prescriptions provides the time limitation that most thrillers require. Whatever can be done must be done before Susie dies of her illness. The secret society, called The Immortalists, are bent on financing research into the genetic causes of aging, and it is important to them that only that select group gets the secret for to make it generally available would produce chaos on a Biblical scale. It is the selection of the elites, a kind of social Darwinism that forms the philosophical underpinnings of the novel. The rationale for keeping the formula a secret shared by only the best sort of people is expressed by elderly megalomaniacal business tycoon who has amassed the greatest fortune on the planet through cunning, luck, and a ruthlessness that would make Scrooge resemble the Dalia Lama. Andreas Xander, whose own death is only months away, wants exclusive rights to the formula so he can rejuvenate his decaying carcass and get another bite of the pizza. It is he who provides the philosophical and ethical dilemma that the possibility of immortality implies. Mr. Mills’ characters are recognizable but unique enough to make them fun, the milieu is well researched, and the plot moves at a varied and compelling pace. The philosophical ramifications of immortality give a bit of weight to the matter, but mostly this is an entertaining read, just right for curling up on the couch on a miserable winter’s day. Its climax and denouement are credible and satisfying. The Immortalists is a truly great mystery novel by one of the best authors working in the genre today.